I might look calm on the outside, but on the inside I am screaming I WILL BURN DOWN THE BUILDING. March 20: We took our then-9-week-old Baby J to the emergency room for extreme congestion. Girlfriend was having trouble breathing and kept coughing till she threw up. To relieve the congestion, two full-grown men had to hold her down and essentially vacuum out her sinuses. IT WAS SO MUCH FUN I CAN’T EVEN. To Baby J’s credit, she timed a hacking cough PERFECTLY and got us admitted before everybody else. April 15: My husband went to the emergency room with symptoms of appendicitis. After a couple hours curled up on a waiting room bench with a trash can placed strategically below his mouth and paling to an Edward Cullen-esque shade of BLAH, we discovered his appendix was fine, but his colon had a VICIOUS germ. Morphine and Phenergan ensued. While he slept in a drug-induced state, I watched the Boston bombings unfold on Twitter. Rough day for everybody. This is not what he looked like on that waiting room bench. I just thought you might want to see how handsome he is. April 25: Our 2-year-old fell down half a flight of wooden steps in our garage. She hit her head at least three or four times and then crashed into the concrete floor below. We took her to the emergency room to make sure she didn’t have head trauma or something else horrible. She came away from the whole thing with just a few scrapes and bruises. As one of my students said today, small children must be made of rubber. We’ll pretend this was our reaction to StairFall 2013. The reality, of course, was much more… explosive. So after all this I would just like to say THAT IS QUITE ENOUGH, 2013. As you can imagine, we are hoping and praying and raindancing that no one will be hospitalized for a while. MAMA NEEDS A BREAK. So does Daddy. And while we’re at it, could we maybe take the world drama down just a notch? 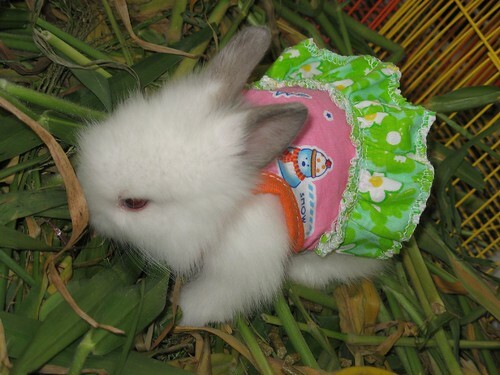 Sometimes, life only makes sense after you’ve seen a picture of a bunny in a dress. Wouldn’t you agree? Here’s to the approach of May: a new, potentially hospital-free month. I’m just so dadgum TIRED. HOLY MOTHER. I knew about all the other’ ones (which in it of themselves were plenty o’ fun) but not M’s fight with the stairs. Lawd, let’s be all done with that now. Yes, that charming little incident happened yesterday morning as we were heading to school. SO MUCH FUN. Girl, you need to CALM THE HECK DOWN. I think the universe has had its laugh and is now busy plaguing some other hapless author/teacher/wife/mother/friend/blogger/generally wonderful person. Although I feel bad for her. I feel bad for her too! Is there a way to defeat the universe? Could I maybe offer it a sacrifice of some sort? I could burn a math book. I know that I was the the universe, burning a math book would be a fantastic sacrifice. The world needs fewer math books. And more Anne Riley books. Hope you all stay hospital-free for the rest of 2013! My 22 year-old son had a brush with appendicitis too. Only his turned out to be an infection of lymph nodes near the appendix. Usually happens only in small children–we’re so thankful his doctor decided not to operate without conclusive proof of an appendicitis. Um, I teared up at the description of StairFall 2013 because….OMG every stair? I’m so glad she’s ok! Wishing you a dramz (and hospital, obvs) free May-December!